This Box is no longer available and the Etsy shop is now defunct. As you might know if you read this blog, I love getting subscription boxes in the mail – they’re like getting a fun surprise or presents every month! And I’m especially excited to have discovered Disney subscription boxes. 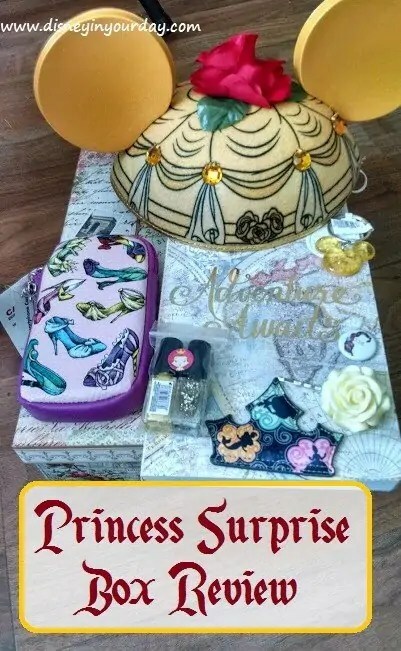 I’ve reviewed a few others so far, but now I’m thrilled to share another one I’ve found, just for the princess lovers! Created by The Charming Violet on Etsy (who also sells incredible looking Princess wigs, if you need one for a good costume! ), this box is themed each month after a different princess. It will contain a variety of different items relating to that princess. You can get a 3 month, 6 month, or 12 month subscription. It costs $20 per month, but if you do 12 months you also get a bonus box! As you’ll see, I think $20 is an amazing value for this box. If you’re not sure you want to commit to more than one month, there is a 1 month surprise box for $25 so you can give it a try. This month the princess was Belle, which is perfect since she is my favorite princess! One of the things that I loved about this box is that not everything in it was a Disney product – though there were plenty of those. However, she also included items that weren’t strictly Disney, but related to the character. To start off with, it even came in a gorgeous box that could be used again for things. 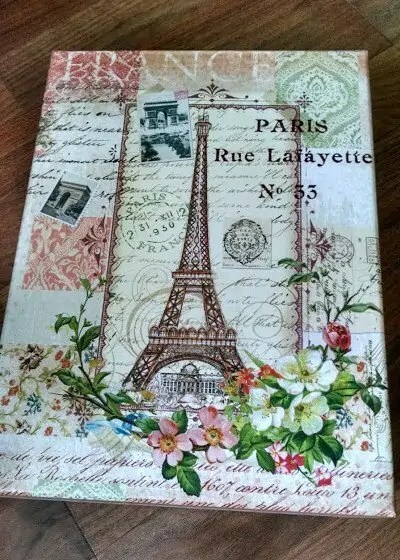 This one was a Paris themed box, and the France box was perfect for Belle. The first item in the box that popped out to me was a pair of Belle ears! I know these come straight from the parks because I’ve seen them there, and admired them on more than one occasion. On my last trip I was really close to buying them but we were trying to save a little money so I resisted. Needless to say, I’m thrilled to see them here! There was also a super cute cell phone case. 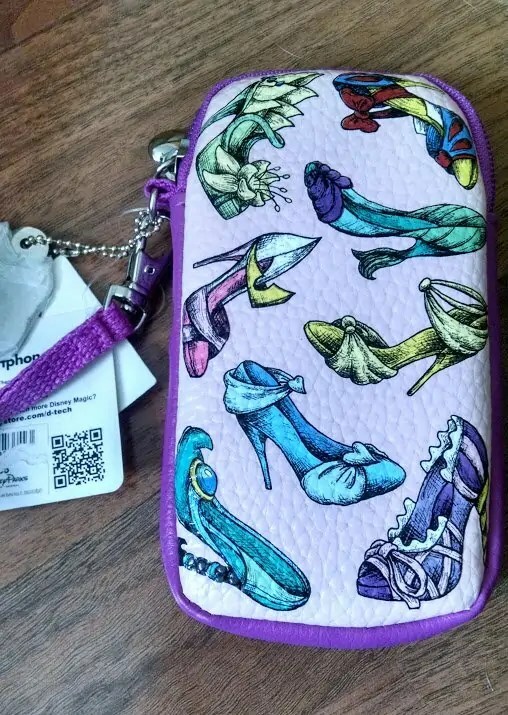 I love the Christmas ornaments that look like the princesses’ shoes, but I didn’t know they made other merchandise with those designs! It’s very girly and very cute. This next item may actually be my favorite thing in the box. While it’s not strictly “Disney,” it fits the character of Belle so well. 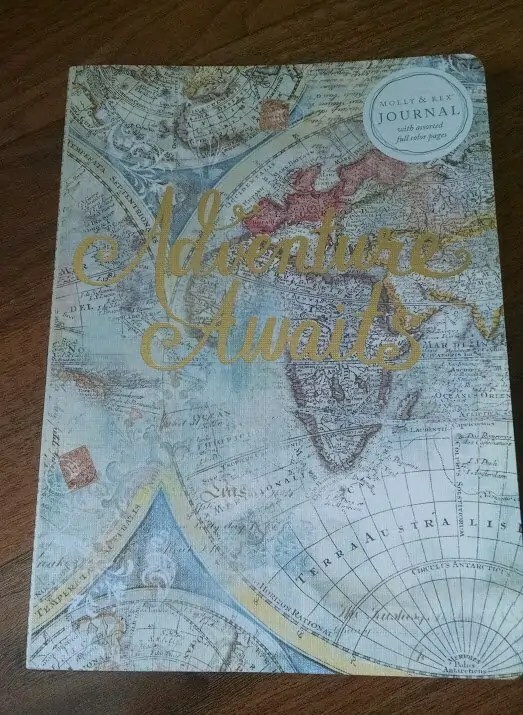 It’s a travel journal that says “Adventure Awaits” on it. Considering that Belle sang about “adventure in the great wide somewhere” and was a big book worm, I bet she totally would keep a travel journal and this fits her character perfectly. I myself do journal when I travel and I’ve almost filled up my previous notebook, so this will come in handy! A couple of other things from the Disney parks included a Mickey keychain and Princess crown magnet. 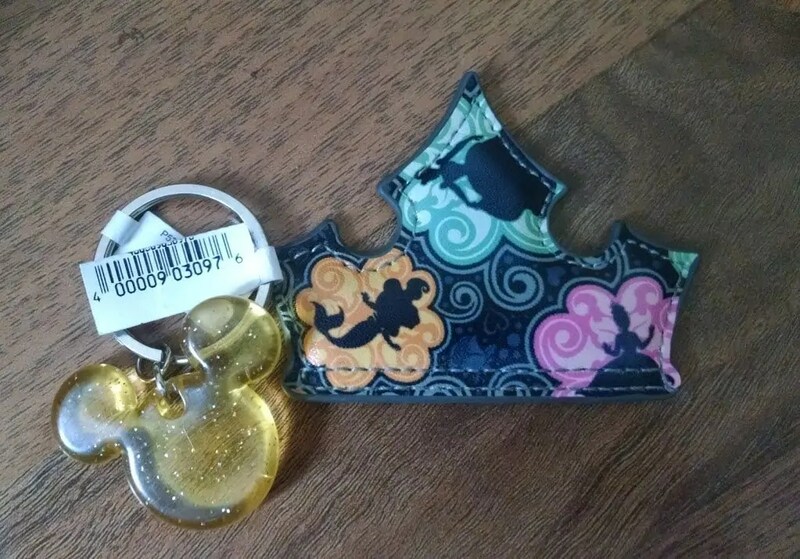 The keychain is yellow for Belle, and the magnet is very princess-y and fun! 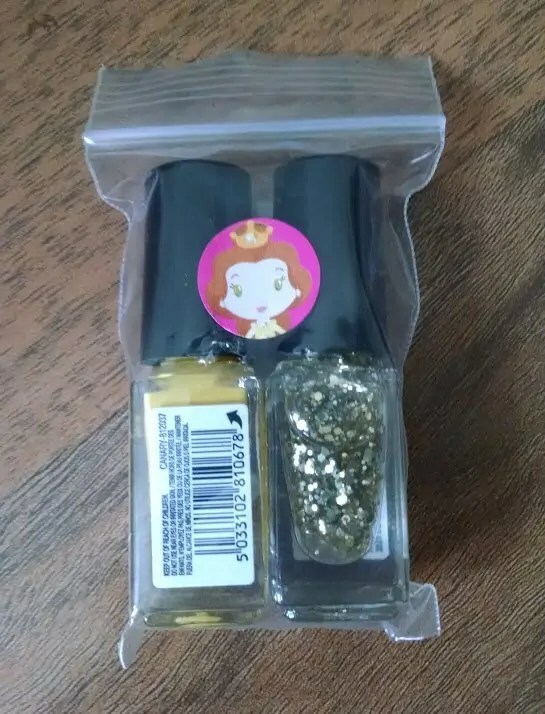 Also included was two mini nail polishes in Belle colors – yellow and a sparkly gold. I don’t wear nail polish that often but I do like to pamper myself occasionally. So I really love mini bottles because I never use a whole bottle of nail polish! These will be perfect to try out when I create a Belle Disney Bound outfit. 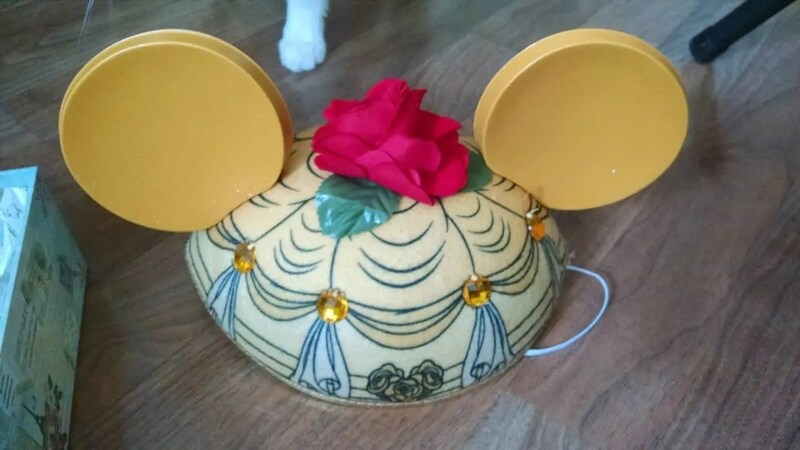 Speaking of Disney Bounding, another item in this box that will work well is an adorable yellow rose hair clip. I love how it’s basically a subtle nod to the character. A Belle button was also included. All in all I was super impressed with this box. I think it was put together really well and was such a good balance of different items, all which worked well to represent the character. I’ve been reviewing a couple of Disney subscription boxes, but I’m such a princess fan that this one may be my favorite so far! 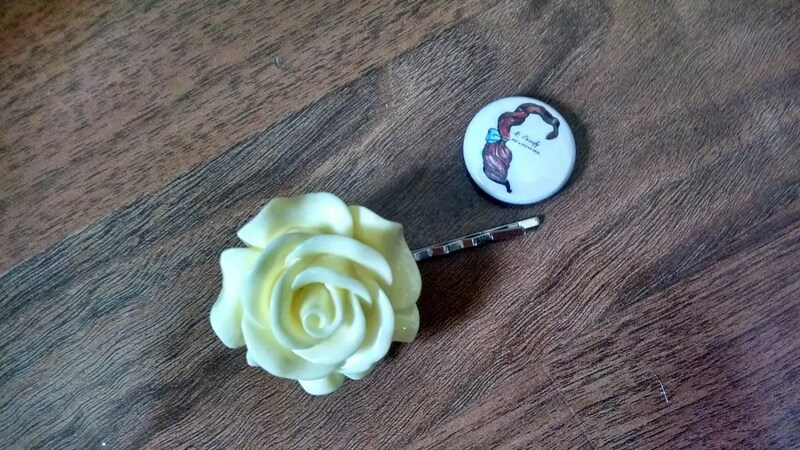 I highly recommend you visit The Charming Violet on Etsy and check it out. You can specify who the box is for (child, adult) to be sure it gets customized to you. It’s clear so much thought and care is put into this box and I just love it! What do you think of the items in this box? Beautiful items! I’m going to have to forward this surprise box review to my girlfriends! That looks so neat! I want to review these Disney boxes so much but they are so expensive I’m having to save up for them. Actually this one isn’t that badly priced. Maybe I will try it out! Yes, this one is very reasonable, especially considering the amount of items you get! What a cute monthly subscription. I like it because it’s so unique and fun. It makes me wonder what the other princess boxes look like. My favorite princess has always been Jasmine most likely because we have the same name. ahah. I’m guessing the other boxes are just as good! I think if you order the 1 time surprise box you can request a specific princess, which would be really nice. If anyone else gets a box I’d love to see what is in it! How GREAT is this box?? I seriously think I need to get it. I didn’t even know that it existed! I’m so happy I discovered it! I would definitely recommend trying it out! I’m looking forward to the boy box as well! Thanks for a great box! Hi, please message me at the email provided. I am back and ready to send you a new one 😀 wooohoooo! Excellent, I’ll be sending you an email! The boxes are usually available on her Etsy site, though sometimes it isn’t available if it’s sold out. I will let you know when they are back up! I can’t seem to find her anywhere. 🙁 Do you know if she went out of business? That’s great to hear, I’m looking forward to seeing them back!